ALMATY (KTZ–Cargo Transportation press centre) — The national railway operator, Kazakhstan Temir Zholy (KTZ), transported 122 mln tonnes of cargos in January-June period of 2018 which represents an increase of 7% year over year. At the same time, tonnage in June is higher than the June 2017 indicator by 7.4%. Grain transportation represented more than 770,000 tons, which is 30% higher than the level of June 2017. 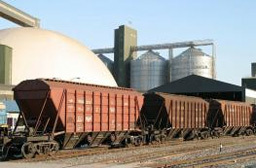 Over 540,000 tons of grain were sent for export, which is 44% higher than the same period last year. From the beginning of 2018, 1861 container trains were preceded through the territory of Kazakhstan. At the same time, the growth of organized container trains from China to Europe was 1.4 times more than for the same period of last year. In the opposite direction of Europe to China, growth was 1.6 times.